Despite the awesomeness that is the 300 film (and the sequel)- the epic battles, the amazing directing, the incredible cinematography by Zack Snyder, and all the impressive special effects- our mission in this site is very specific, and thus, this article focuses on the historical inaccuracies of this movie. Identifying some of these historical inaccuracies, starting from Sparta’s then-political system, in the film you can easily see members of the Spartan senate portrayed as unpleasant monsters. Yet, in reality, Sparta’s senate consisted of 30 members who were perfectly respected and accepted by citizens. According to historical records, 28 senate members should have been over 60 years of age and boasting a rich history of contributions and relationships among the most elite circles of the Greek city-state. Two of the aforementioned members were the two kings of Sparta, the only members who could be younger than 60. This happens to be another major historical inaccuracy of the film, since Sparta has always been known as the only Greek city-state (at the time) with two kings; one went to war and led the army and the other stayed in Sparta to command the state. In this way, the Spartan government and army always stayed disciplined and the king held them under his command. In regards to Spartan training, the film commits another mistake by showing a young boy hunting in the mountains alone. This contradicts historical evidence showing young warriors always hunted in small groups, enabling them to learn from their youth, how to function in an organized group of warriors, and also minimizing the occurrence of preventable fatal accidents during training. Zack Snyder also presents Spartans fighting almost naked, wearing only leather underwear and a red cape, most likely inspired by Superman’s outfit (according to Snyder, the movie was more based on Frank Miller and Lynn Varley’s 1998 comic series of the same name, than actual history). 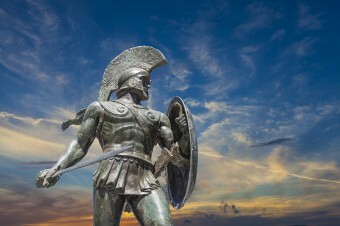 In reality, the average Spartan warrior wore many kilograms of war equipment, usually made of iron. As for why the garments Spartan warriors wore over their iron military equipment were red, according to legendary Spartan legislator, Lycurgus, this color simultaneously had a negative effect on the opponent, and helped to hide Spartan warriors’ blood if they were wounded. One of the film’s most popular scenes is also a product of fiction rather than reality. Xerxes never sent Leonidas any messengers demanding him to surrender, and thus, Leonidas never committed murder by throwing said messenger in the giant pit of death. Herodotus mentions this had happened in the past and, for that reason, Xerxes never sent any messengers to ask the Spartans to surrender. Another historical inaccuracy consists of the fact that Leonidas appears to have a face-to- face conversation with Xerxes, an event never recorded by Herodotus. Xerxes, as well as the vast majority of Persian characters in the film, are portrayed as evil, blood thirsty, misogynist, and monstrous-looking creatures. In truth, they were recorded as educated and well-trained soldiers having great respect for Greek culture and civilization. Of course, we couldn’t exclude from this article one of the most famous traitors in history, Ephialtes. According to Herodotus, Ephialtes, who by the way did not look like a monster, never harbored any intention to join the Spartan (or any Greek) army. Instead, he betrayed his fellow Greeks for money and personal benefit. Unfortunately for him, he didn’t live long to remember his betrayal as Leonidas had wished him in the film. Instead, shortly after his betrayal, Athenades murdered him, an act that the local Spartan authorities later honored and acclaimed. Last, but not least, we come to the half-blind Spartan soldier named Dilios. Leonidas himself sent Dilios back to Sparta before the final battle in Thermopylae, claiming Dilios had a great talent with words and should deliver the “message” of the heroic resistance to everyone in their homeland. Shortly before the end of the film, Dilios also appears leading the united Greek army at the battle of Plataea, not just a mere inaccuracy, but also a historical crime, given the leader of the Greek army in this specific battle happened to be one of the greatest generals who has ever lived, Pausanias. However, in all this mess of historical harassment, there’s a small dose of truth as well. According to Herodotus, among the 300 Spartans there were indeed two soldiers stricken with an ophthalmic disease and ordered to return home. One of them, Eurytus, returned to Sparta and ordered his helot servant to take him back to the battle once again, where blind and severely wounded, he died heroically next to his king. No man would give him a light for his fire or speak to him; he was called Aristodemus the Coward. However, at the Battle of Plataea, Aristodemus redeemed himself by fighting with notable courage and bravery, in this way, gaining the respect and admiration not only of his fellow Spartans, but the rest of the Greeks as well. In the end, this is yet another example of why you should never, ever look to Hollywood for historical truth or accuracy. Zack Snyder never promised to educate through this film, since his fascination with the art of comics is already well-known. Instead, he achieved his main goal of impressing cinematographically, and certainly creating a great work of entertainment. Beautiful Theo, thank you for setting things right :)! I’ m waiting eagerly the history lesson for the sequel!!! Having a public education I had no idea who the 300 were until I saw this movie. Mr MIller, I am the person who was fascinated by the movie and read about the actual battle and visited Thermopylae via Google Earth. I am amazed how much the sea has receded. I really don’t like how the Persians were portrayed, they were the exact opposite. I know this is just a film but at least give “perhaps” the most morally correct people some respect in the film industry. well honestly directors like zack snider are hollywood directors, not documentalists. in fact the movie was banned in quite a few countries of persian descent. I would strongly recommend the book “Gates of Fire” by Steven Pressfield. It’s one of the best books I have ever read, and not only does it tell the Spartan’s tale with the most accuracy possible, the intricacy and uniqueness of the storytelling (told from the perspective of a squire of a spartan who was resuscitated after the final battle) is very compelling, making you really emphasize with the soldier’s mind and the bittersweet life of an orphaned boy who grew up in the harsh world of Lakedaemon. You have a MAJOR inaccuracy of your own – the cinematography is *not* by Zack Snyder. He is the director. The cinematographer is Larry Fong, and should be credited as such in your essay, which, as it stands, suggests you don’t understand how movies are made. I’m a history teacher, and I think it’s great. Think about it like this: take your average American, and imagine he’s never seen this movie. Ask who Xerxes was, who Leonidas was, who invaded Greece, what life was like for a Spartan man, etc. You’d get blank stares and a request to change the subject. But from one who has seen it, you’re going to get a 70% accurate history. I’ll bet he knows more about the Persian Wars than about things he’s “learning” “accurately” in school. Why would that be important in everyday life? Also its important to note that the description of the movie states Xerxes army is around 1,000,000 strong, but in reality there were only around 100,000.